Now I'm wondering where the waistline would be located in this pattern? 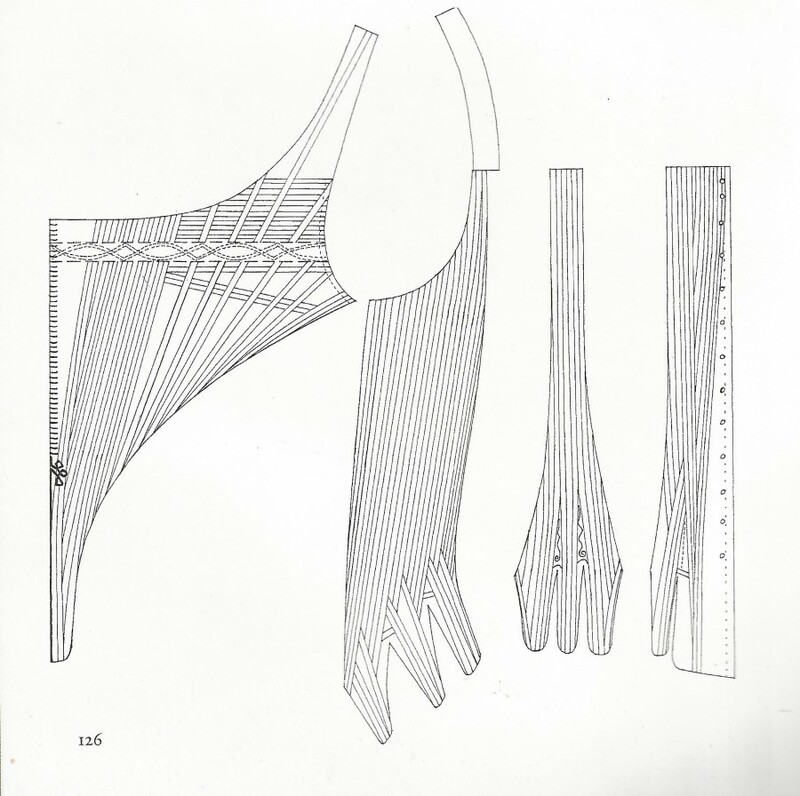 My brain would say around where the boning changes direction to go into the tabs and not the tab itself, but maybe someone else might know better or has a better understanding of 18th century stay patterns? Making a paper mockup didn't clear it up for me. First, my apologies for being late, despite being first on this community, to respond to your question. I think the answer might depend on what you're making these stays for, and it might also depend on how necessary historic precision is going to be. Will these stays be worn in a theatrical production (where they'll be seen), for several hours at a time and night after night after night? This could determine how the stays fit, based on the artiste's needs. Will they be displayed on a mannequin as part of an exhibition of historic attire or of historic foundation garments? Do the stays you plan to make represent "generic 18th century," or are they to be historically accurate or historically precise for a given half-decade of the 18th century? The 18th century silhouette changed over that hundred-year span, and it varied, too, according to one's rank and social standing and, to a degree, where one lived. When I look at images of or patterns for any pair of 18th century stays I find myself thinking of the natural waistline at the side of the body, in determining the waistline, that place where if you bend sideways your side sort of creases. Obviously, the center front of the stays is lower and differently shaped than the body's natural waistline. And it's always tempting to say, "Well, of course the waist[line] of the stays must be where the pattern is narrowest," but that isn't always the case, either. I hope this helps in some small way, perhaps helping to direct your own thoughts. Thank you for your reply! It sure did give me something to think about. Since I'm making this for myself to wear under a robe a la Francaise, I decided it doesn't have to look 100% authentic, but the shape should be close to the original as possible. I scaled it up in basically the same way as I would with other corsets and a quick mock-up turned out fine. Now let's see if the actual one will turn out fine. If not, it's a lesson learned :). "It sure did give me something to think about." It's very kind of you to say so! I actually have to do a bit of thinking myself, about a set of stays I'll be needing for an Independence Day (Fourth of July) celebration and parade in my community. I've been asking myself if I want to make stays that are "generically 18th century," or stays which are or were au courant in 1776, or stays which could have or would have been worn in that year although they would have been made some years earlier. In the end it won't matter to anyone but me, but one thing going through my mind is always, "What if I need accurate stays later on?---and have to invest the time and the labor and materials a second time?" I know that isn't helpful to you, and I apologize for that, but I hope you'll continue to post here on this community because I'll be interested in watching your stays as they progress or progressed, and how you make or made the decisions you'll make. Something I know!! I can expand a bit on why different extant examples of stays have different lengths and different waistlines. As the other commenter noted, stays design shifted over the course of the eighteenth century. A good example of the beginning would be the first picture you attached--note how they're long and extremely conical. 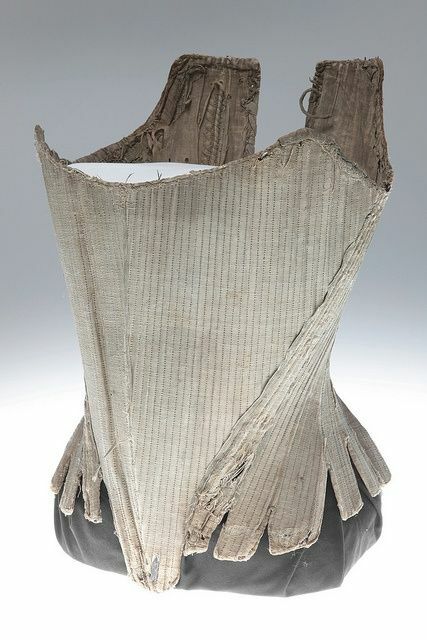 If you look into early 18th century dress, long, rigid, conical torsos were the style at the time. Throughout the 18th century the conical shape was in fashion, but as it progressed, stays became shorter, until there's a very noted difference in length. The second picture you attached would be a good example of later 18th century stays. That answers the question of why there's such a difference. As for the pattern, I wouldn't be able to tell for sure without a grid for scaling or context, but in many stays the tabs are meant to flare out over the hips. In shorter ones this might not necessarily be the case, but either way the tabs are meant to flare out--that's why they're there and it's not just a solid piece of fabric. The narrowest part of your body in stays is not generally supposed to by at the end of the tabs, as far as I know, because that just. Doesn't make sense, you know? Their cut and design is there specifically to flare out and smooth the lines of the body because the displaced fat from the waist has to go Somewhere. So, I'd say your assumption that the "waistline" (not sure if that's the proper term when discussing 18th century wear but idk) is around where the tab boning intersects with the rest of the bones is fairly accurate. I'd encourage you to look at what part of the 18th century your pattern is from in order to help figure out how it should fit you. Sorry if my wording is a little wonky, it's like... 2:30 AM? Thank you for the reply! Yes, I'd love to get more detailed information about stays! The pattern is from the book Fashion, a history from the 18th to the 20th century volume 1 and it's taken from an actual corset (Kyoto Costume Institute)which is dated 1760-1770. By the way, are you familiar with this site?